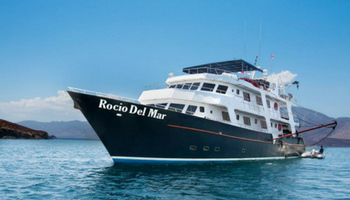 Baja California Liveaboards - Compare prices online. Book now & pay later. The Revillagigedo archipelago is around 300 miles (500 km) south from the tip of the Baja peninsula. It comprises Socorro, San Benedicto, Clarion and the small Roca Partida islands. These are the tips of an underwater mountain range. The Revillagigedo Islands have been designated a World Heritage Site. Rainfall is scarce and takes places mainly during August to October. The average water temperature ranges from 22oC in winter up to 29oC in summer. The best time to dive Socorro and the other islands is between November and May. In January to March you may well see humpback whales when they arrive to calve. From May to July you get large shoals of small fish which form "bait balls" when predators are around. These bring in the large pelagic fish like silky sharks, hammerheads and tuna. 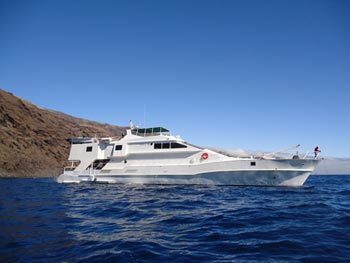 You dive the Revillagigedo Islands from a liveaboard. These depart from Cabo San Lucas. Visits the Midriff Islands, departing from Puerto Penasco, and Socorro. "Crew's great, boat's great, diving is awesome. 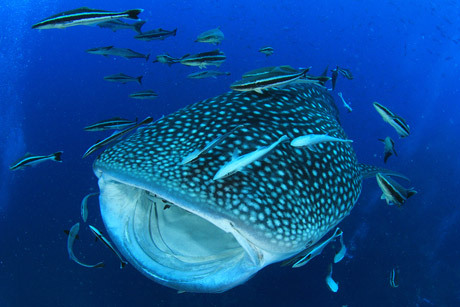 Where else can you swim with a dozen whale sharks? AND..see them all most everytime. Been twice in 2 months and going again in Oct 2011. $2295 a week, plus $100 for Nitrox, $25 Park fee, tips 10-15%.."
Caters to up to 16 divers in 4 quad cabins, each with 4 beds with privacy curtains and a storage drawer for each guest. Visits the Sea of Cortez, including the beautiful Cabo Pulmo. Valentina was launched in 2013. She has space for 20 passengers. There are 10 cabins on board. All are ensuite. There are 2 cabins with double and single bed, 1 room with double bed and 7 staterooms that have bunk style beds. For Guadalupe departs from Ensenada. Shuttle will pick you up from San Diego or Tijuana. You can hire all your equipment from the dive operators around San José del Cabo and Cabo San Lucas. You can also book boat dives with them. However, it's much cheaper to negotiate with the fishermen. With a fisherman you usually go out in a Panga: a fibreglass fishing boat around 24 foot long. Three branches in Cabo San Lucas: Plaza Las Glorias Hotel, Plaza Las Glorias dock and next to the El Coral restaurant on the Marina Boulevard strip. Part of the Palmilla Hotel complex, near Pepe's bar, by Palmilla Beach. Cabo San Lucas Baja Ca. "Established 1989, Full service PADI Shop#22248, Certifications, Dive Tours, Air fills, Repair Service"
"Full service technical and recreational scuba facility in Cabo San Lucas. We are specialists in diver education at every level and our aim is to develop confident, capable, underwater enthusiasts and explorers.Offering optimum breathing gas technology and implementing the world�s most strict purity standards for air (independently tested every 3 months, with results viewable on our webpage)Full assortment of diving equipment for both sale and rental.We offer the largest range of scuba tours and courses in Los Cabos!!" "Fantastic Dive operation offering a range of technical and recreational diving. Casey, Mike and Greg all did a fantastic job of looking after us during our week of diving!! Offer round trip transportation from San Lucas and San Jose, boxed lunches and overnight accommodation. "Big, speedy boats. Excellent onboard service. Quick to answer any emails. Amazing hotel service and of course a very professional staff made my diving vacation an awesome experience. Even after having bad weather on the area they sent us to a gray whale tour. Don�t miss the breakfast on their sea view restaurant. Rodrigo handles reservations and packaging, he knows very well his business. Gina and Orlando at front desk helped us on local attactions -La Paz is an amazing city, full with great restaurants and even an amazing Whale Museum. I�ll be back pretty soon. Clean, spartan rooms with good WiFi, some cable channels on flat-screen TV. Boat had full tank racks, O2, and amazing ceviche as snack/lunch. Pricing is very competitive with the other hotel/dive centers but the best boats and the huevos norte�os are on Cantamar. Cantamar hotel has a beautiful piece of beach and a nice pool. Got a great tan in the middle of winter. " "We had booked a dive with him 2 weeks before going to Mexico, drove over from our hotel in Cabo, rented another hotel for 2 nights. Reconfirmed with him the evening before the dive was told to meet him in the lobby of our hotel at 7:30...he was a no show, wouldn't answer his phone. The staff at our hotel finally got ahold of him and he said we could go the next day!!! Very disappointing. "We had a great diving week with Fernando Aguilar and Baja Diving and Service, we want to fully reccomend this dive operation to everyone. The cost for the diving was about 95 American dollars. The hotel was really clean, the service was excellent as well as the food, the boats were a little bit crowded but I guess it was normal for high season, the divemasters took great care of us so it was ok. A lot better than Cabo!" "I just spent a week at Cantamar in La Paz. The diving was great but when I paid with my credit card they charged almost 10 percent more than the rates posted on the internet. Then they said it is the banks fault but the hotel just converts the dollars at an outrageous exchange rate - and then tried to blame the bank which actually used a very good rate. Cantamar says this is normal but I lived in Mexico for 3 years and this is a very shady and unscrupulous practice. In addition, they would ask for a surcharge of 20 dollars to take us to special dive sites but then pack the boat with up to 20 non-divers. My advice after diving in Cozumel, Aruba, Curacao, Bahamas, Bay Islands and Costa Rica is go to another dive shop and hotel -- by the way their hotel is a 20 dollar cab ride from the town of La Paz so they hit you up for every little thing you need." " After much complaining Club Cantamar is now considering a refund of the difference between the amount they advertise and the amount I was actually charged on my credit card (it was $137 more than the rates on their web site). I will let you know if I get a refund - but I think divers should still know their policy." "Fernando Aguilar and his crew were the best! Always accomodating! Complete knowledge of dive sites. Good housekeeping and safety. Great accomodations... good thing there was a store that I could buy a swim suit ( since the airline lost my luggage). Very good value for the money. Divemasters were worth tipping all day long! As good or better than most places we have been diving for the last 20 years. Can't wait to come back! (and maybe find a flashlight that I loaned to another diver... yeah, I know). "The Cortez Club in La Paz is Baja's premier dive center." Offer SCUBA diving, kayaking, whale watching and camping eco-adventures. Buena Vista is sixty-five miles South of La Paz and sixty five miles North of Cabo San Lucas. 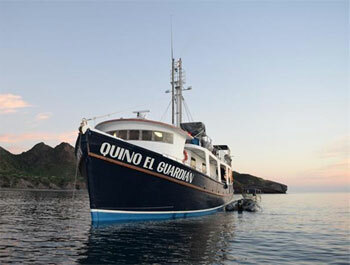 Dive trips offered include Cabo Pulmo and Gordo Banks. Offers accommodation, diving and other activities such as kayaking, sailing and whale watching. Please add your comments on diving in Baja California.Do you want to recommend a dive operator? Let us know.